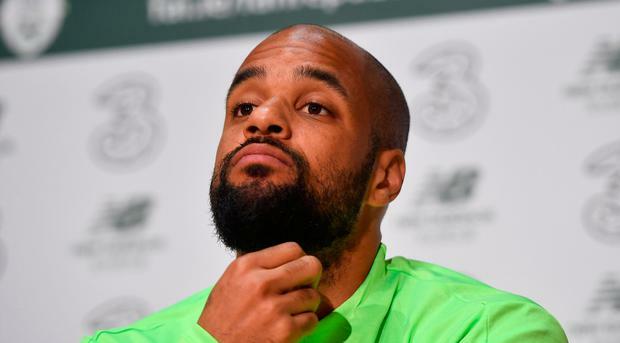 THE goosebumps were not reserved for David McGoldrick as Ireland fans rose to salute a new hero who had taken far too long to announce his arrival. As his No.9 board was hoisted into the Dublin sky to confirm the substitution of the Sheffield United striker in the final minutes of last month's Euro 2020 qualifier against Georgia, McGoldrick hauled his weary body off the stage he had used to make a belated breakthrough in Ireland green. What happened next will live long in the memory, as acclaim echoed around the Aviva Stadium in a show of affection that has rarely been afforded to a player outside the elite list of our all-time greats. 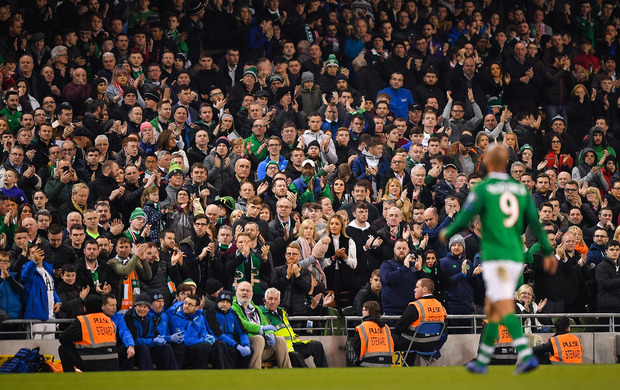 First there was applause from Ireland supporters, before there was a collective feeling that McGoldrick deserved more and by the time Ireland's new first choice striker reached the touchline, the ovation had developed into a defending crescendo. It was an uplifting scene that touched all present and while McGoldrick was the focus of the acclaim, this was a moment for all Ireland fans to dare to dream again, as the clouds of pessimism that had blackened the mood around our national team were lifted by returning manager Mick McCarthy and one of his old guard. 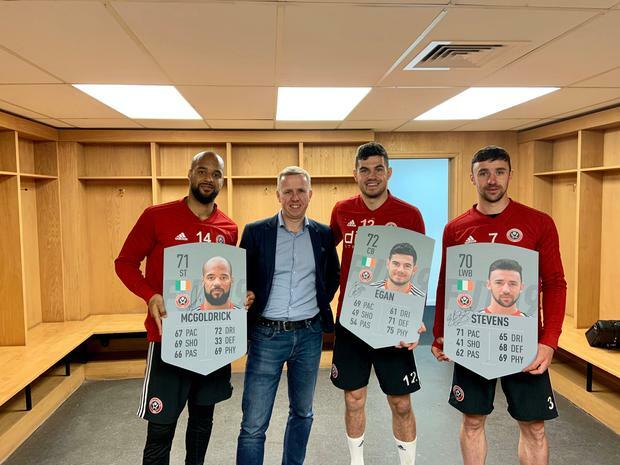 A little over a week after that spine-tingling snapshot in time, McGoldrick sat down for an exclusive interview with the Sunday World at Sheffield United's Bramall Lane home and it was evident that the night has left a lasting impression. "I remember looking around the stadium as the applause got louder and louder and thinking 'is this for me? '", stated the player known to all as Didzy, speaking at an EA Sports FIFA 19 event. "To be honest, I was more shocked than anyone by the reaction I was given, but I'd like to thank all the fans that made that happen. It was incredible. I thought I'd played quite well in the game, but to get that reception was amazing. Whatever happens next in my career, that will always be really proud moment for me and my family. "When you play for your country, you have to give it your all and that's what I did. The fans obviously appreciated the effort I put in and they showed once again why Ireland supporters are the best in the world when it comes to getting behind the team. "I think the supporters were just pleased to see the team playing like that again, with real passion and that win was a real team effort. That's what Ireland is all about." Such adulation has rarely been forthcoming for McGoldrick over the course a 16-year career that he openly admits could and should have delivered more. On a journey that has taken him from Notts County to Southampton, then on to Nottingham Forest before he worked under Mick McCarthy's tutelage at Ipswich, McGoldrick appreciated his reputation in the game was less than stellar last summer. "I'm sure every player looks back on his career when it's finished and believes he could have done more and I will certainly do that in a few years time," continues the striker whose golden tooth is a distinctive feature as he speaks. "What I have done this season is given myself a chance to make up for lost time and the last few months show what I can still achieve in what is left of my career. "There have been times when things have a gone a bit stale and maybe I didn't do things as professionally as I could have done at times, I know that doesn't sound great, but it's the truth and I can't do anything about that now. "I said after the Ireland game in my RTE interview after the Georgia that I needed a kick up the backside in my career and that was just me being honest. "You don't realise how good your career is until is it put under threat and that's what happened last summer when I could sense that lot of managers were wary of signing me. It wasn't nice to see. "I had a negative reputation and it was putting clubs off. People didn't say anything to my face, but I knew that's what they meant when they were questioning me and it was not nice to hear, so I had to prove them wrong. "Those people doubting me worked gave me the motivation to come back fitter and stronger this season and the rewards have come. "I have played an important part in Sheffield United's promotion challenge and got back into the Ireland set-up under Mick. Maybe what happened last summer was actually a blessing in disguise." 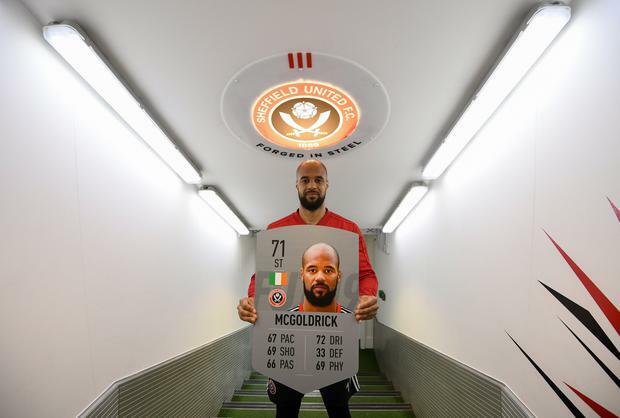 McGoldrick could get his first chance to shine in the Premier League next season if he can lead Sheffield United into the top flight in the final month this campaign and he is convinced his glory days are still in front of him. "Age is just a number and even if I am 31, it feels like what has happened this season has been a new chapter in my career," he adds. "My game is not about pace and it is more about linking the play and using my experience from playing over the last ten years to my advantage. "In that respect, I feel like I'm a better player now than I was four or five years ago. You learn what you need to do the more you play, especially if you are in a lone strikers role like I was against Georgia. I feel like there is a lot more still to come for me." McGoldrick was a firm favourite of McCarthy's during their time together at Ipswich and now they could form a double act that could hold the key to Ireland's hopes of qualifying for Euro 2020. EA SPORTS FIFA 19 is available on PS4, Xbox and all platforms, head to https://www.easports.com/fifa to get your copy.